Here you will find a description of features and tips for different situations and cases regarding e-shop services and features. Just click on the point you are interested in, and you will see full description often accompanied by visualizations. Where and how can you verify your personal information to get a full account or discounts entitlements ? And what is needed for it? Verification of personal data is performed on all ticket sales points of DPMB, a.s.You will speed up your verification by taking a carrier (a Visa or Mastercard contactless bank card) that you have registered with your profile in Brno iD. By reading your carrier, DPMB employee will immediately see your account for verification, and also check the functionality and accuracy of the carrier. However, you can carry out verification of your personal data without a carrier. In order to let verify your data, it is first and foremost necessary to prove the correctness of the personal data using the ID card. For children (up to 15 years) who do not have ID card yet, the data can be documented by the original birth certificate. In the case of foreigners, the data can be provided with an adequate official identity document. - other university students can use valid ISIC student card number for online verification also by using button in the "My Account" (only with full account). - or postage order cut-off for the payee: "Pensions - payroll"
How to buy a student public transport ticket online immediately? And how to solve student status online? You need a customer account in the eshop and in "My Account" section to fill in personal information (name + surname + birthday + permanent address) and uploaded photo. You will then have access to the purchase of non-transferable tickets. To buy a student ticket, you need to have a student status assigned to your account as the discount category. If you already have a verified full account and you are a Masaryk university / Brno university of technology / Mendel university student, you can easily arrange this category online as described below. For other school you can use online verification using number of your valid ISIC card. If you do not have a full account (or if you are from school that does not allow online validation and do not have ISIC cards) and you want your student ticket immediately, you have the option of assigning a discount category for 5 days (this assignment can only be done in each account once). When buying a ticket, use the "solve" button to select the "student" category as in the following pictures. After assigning selected discount category, you will be able to choose and buy the required student ticket. Subsequently, however, it is necessary to appear within 5 calendar days for verification of personal data. After this verification, you will get a full account. Verification is done by all DPMB sell affiliates and requires a carrier (Visa or Mastercard contact card registered in the profile) and ID card. If you are from Masaryk university / Brno university of technology / Mendel university you do not have to solve anything else. You only have to verify your personal details and then resolve your student status online as shown below. If you do not study at the above universities, you can use online verification by using your valid ISIC number at the same section. If you have a verified account and you are between 18 and 26 years of age, you will see in the "My Account" section the "Verify student status" button. After using the button you will be redirected to the page where you choose your school by clicking on its logo. Brno university of technology and Mendel university students will then fill in their student id (student number) and use the "Send request" button. For other schools use ISIC validation. For Masaryk University it is necessary first to use link and go through IS.MUNI system to give the necessary consent for the transfer of personal data and then return to the e-shop and enter the UCO (student id) and send it. Then the system (usually within about 10 seconds) will automatically evaluate your request, and you will see a successful pairing on the My Account tab. Once successful, online validation is renewed itself regularly and you do not have to deal with anything. If the automatic extension of student status fails, you will receive email 7 days prior to the student status expiration date. If you have stopped being a student, just wait for the expiration. Remaining validity of your ticket will be then shortened proportional to the difference in prices between the original reduced price and the normal base price of your ticket (by students the remaining validity will be halved). You can continue to use this modified ticket until the new end of its validity. If you get your student status back, the remaining validity of your ticket will be (at the beginning of the nearest day) proportionally extended again. How do I add a new ticket carrier? Once you have signed in to your profile, you select the section "My carriers". In this section you can add your valid Visa or Mastercard. Added card will serve as a ticket carrier. Click the "add new ticket carrier" button. You will be redirected to safe site, where you can add in the "Registration Card" window the card number and its validity. Then click on the Register button. 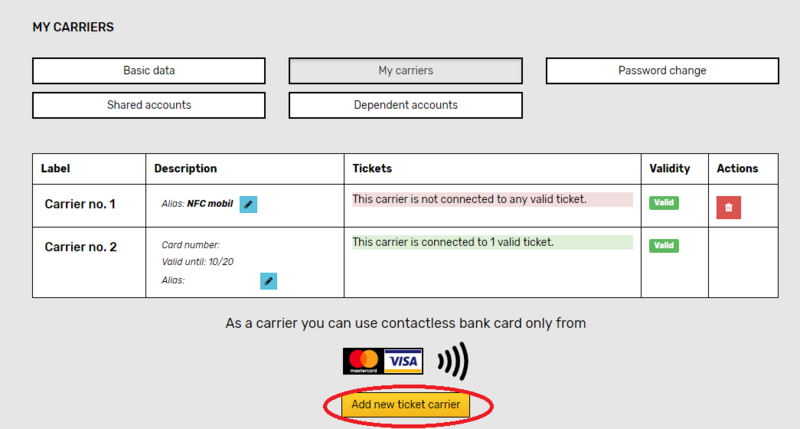 Once you have added a new carrier, that you want to use instead of the old one, be sure to transfer any of your valid public transport ticket coupled to the old carrier to the correct new carrier (in the My Tickets section). If you have received a new card from your bank and want to use it as a carrier, you must always register it again, even if it has the same number as the previous card. They differ in the validity date, and number + validity are used in the calculation of the secured card's "token" done by card readers. You can use a contactless sticker instead of a regular credit card to register. However, the whole card number is not shown on the sticker. You need to look at the plastic label which you got with this sticker (there should be written full card number) or contact your bank for help. You can also use the NFC chip on your mobile phone where you have your bank card added (virtualized). The NFC chip sends in reality a different number than your plastic bank card, so registration with card number and validity will not work. For correct pairing with your account, you need to visit the EOC Contact Center on the 2nd floor at Novobranská 18 and add NFC card through tokenization done by certified bank card reader. If you do not have or do not want to use your contactless bank card, you can buy an anonymous bank card, which is available at all DPMB branches for 99 CZK. Use the blue button to set an alias for your carrier. It makes work with carriers clearer. Use the red basket icon to delete your old carrier that you no longer use (so that you don’t add a product to it by mistake). The QR code is part of an email confirming payment for your ticket order. It can also be found in the eshop after signing in to your account. You can download/print it. You can find it in the "MHD" - "My Tickets" section. Under the QR code there are two icons. The icon with the printer icon is used for fast printing. Down arrow icon to download as a file on your PC or mobile device. The QR code is downloaded in pdf format. If you do not have the possibility to print a QR code, we will be happy to assist you with the press at the EOC Contact Center. If the passenger uses IDS JMK to travel in zones 100 + 101 ČD trains or IDS JMK regional buses, he has to present his electronic public transport ticket in the form of a QR code in printed form or displayed on the display of an electronic device. For traveling in DPMB lines 1-99, the QR code does not replace the main ticket carrier (contactless payment bank card). How do you add a temporary discount category? So you can buy a discounted public transport ticket for example right after you create your account. 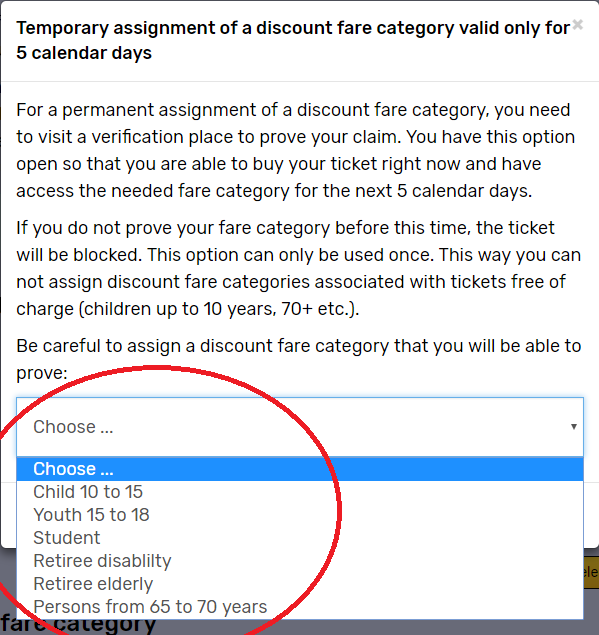 If you want a discounted public transport ticket immediately and you do not have a verified account with your discount category, you have the opportunity to assign the selected discount category for 5 days. When buying a ticket, use the "resolve" button and select the appropriate category for which you are eligible as in the following pictures. This claim must be verified within 5 days at any DPMB verfication place. If you do not verify your claim before this time, the ticket validity will be automatically shortened (proportionally to the difference against basic price). Please note that this assignment can only be done in each account once, the period runs from the date of assignment regardless of the validity of the ticket. How to apply for grant application to the yearly standard ticket for public transport? Everyone who is paying for waste in Brno (citizens and owners of local properties) have the opportunity to apply for a grant to the electronic yearly standard non-transferable ticket for zones 100 + 101. The contribution is CZK 1,425. Apply can any person who is a taxpayer of the local municipal waste tax in Brno and is not fully exempt from the payment and has no debt on municipal waste tax at the date of filing the application or on the date of the decision to grant the contribution. The customer first signs up with an email address and set his password at this e-shop. Subsequently, in the "My Account" section, he / she will fill in his / her personal details and upload a photo. Then choose the ticket carrier (any contactless Visa or Mastercard payment card, or the so-called anonymous card that you purchase at DPMB for 99 CZK). You can buy then your yearly standard transpot ticket. 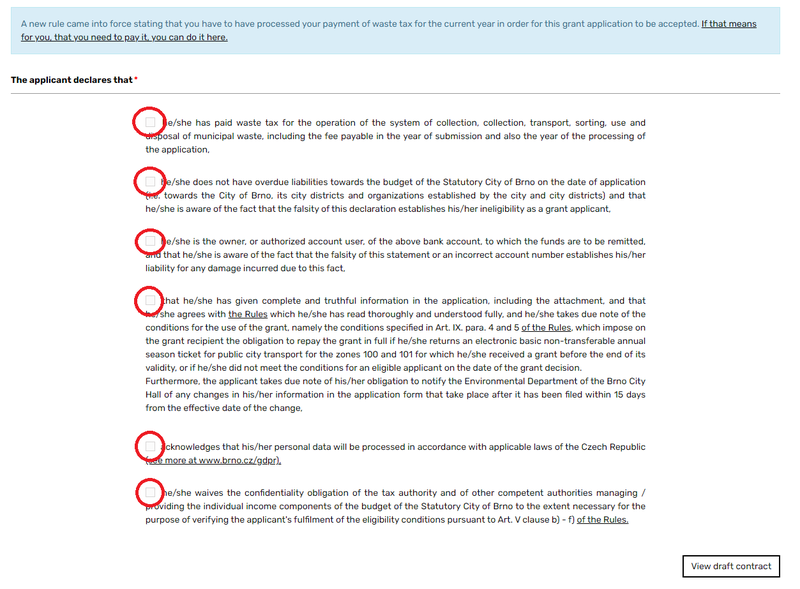 Once you have verified your personal information (your account get "full" status), you can apply for a grant from the city of Brno as described below. All DPMB affiliates verify personal data, you just need to submit your registered carrier and ID card. Customers who already have a verified account or will undergo verification and purchase a standard non-transferable yearly ticket for zones 100 + 101 can apply for a grant immediately upon successful payment. Where can I find the "button" for grant application? After signing in / picking you choose "MHD" and "My Tickets" section, where you will see a green button by the ticket you purchased. Attention! Application for a grant is required within 60 days of ticket purchase !!! In the form shown, fill in the account number where you will get sent a grant of CZK 1425 from City of Brno. You can also add a possible correspondence address (if it does not match your permanent address), you agree to 5 statements and then click the "view draft contract" button. After reading the contract, click the "sign and submit" button and send the request. After sending and processing successfully, you will receive an e-mail message from the City of Brno with the grant application number. You can check status of your application also in the e-shop. Now you have a successful application. How you can return a public transport ticket from home? In your customer account, you can return your non-transferable ticket, which you no longer want to use, from the comfort of your home. Just sign in to the "Public transport" part of the e-shop and use "My Tickets" link on the left. Then click on the red arrow in the "validity until" box, which redirects you to the return form. In this form, you enter the date to which you want to return the ticket and the CZ bank account number. You will also see a preliminary amount of returned money. Do not forget to confirm this action with your e-shop user account password! What is it and how is working monthly follow-up ticket? 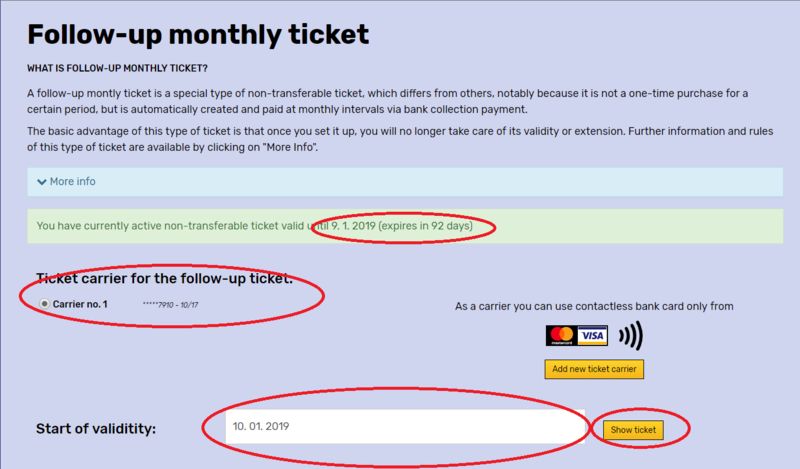 A follow-up montly ticket is a special type of non-transferable ticket, which differs from others, notably because it is not a one-time purchase for a certain period, but is automatically created and paid at monthly intervals via bank collection payment. The basic advantage of this type of ticket is that once you set it up, you will no longer take care of its validity or extension. Realisation and processing of a collection payment takes some time and because of the variable follow-up ticket price (see below), we do not allow the ticket to be created separately but only as follow-up to other valid non-transferable ticket or previous paid follow-up ticket. 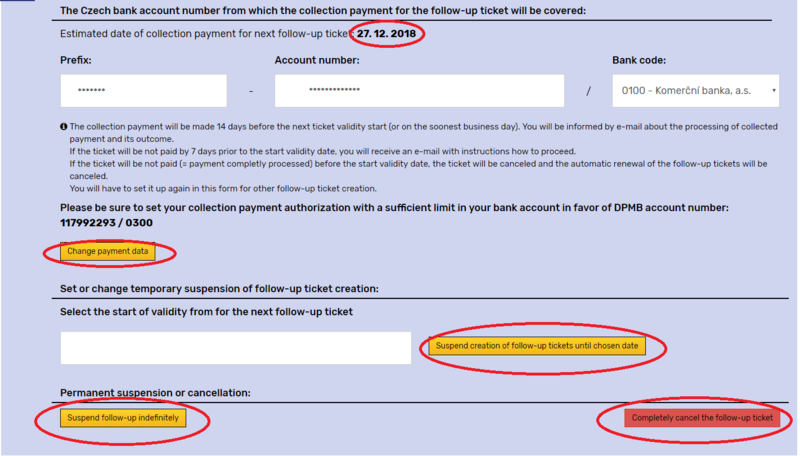 Creation of a follow-up ticket requires a ticket carrier, a choice of starting validity (the earliest allowed is the day after the end of the current valid ticket, which is at least 15 days from today) and the entering of your bank details. You need to have a purchased ticket in the BrnoID e-shop for the possibilit to buy a follow-up ticket. After signing in you choose "Buy ticket" section and "Follow-up tickets". 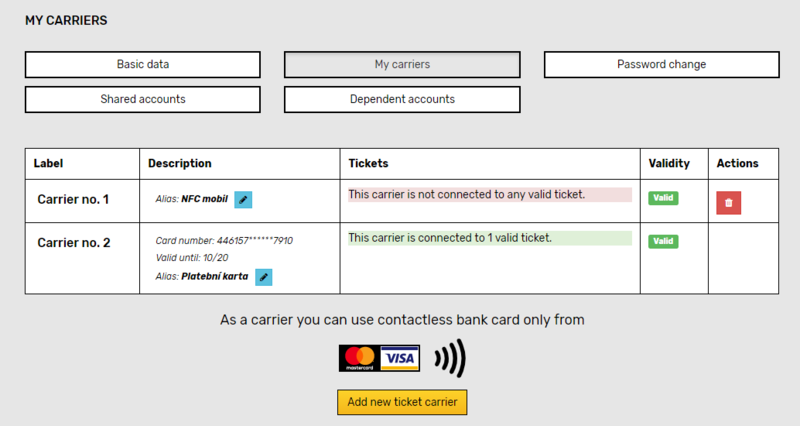 On the displayed page you will see your current non-transferable ticket with its validity. You can also choose the carrier to which your ticket will be assigned and select the start date of your follow-up ticket. Then click on the button to view the ticket. Below you will see the so-called follow-up ticket parameters. Here you will see the initial price and the validity of the follow-up ticket. Enter an account number in the empty field to be charged. Then click on "Establish follow-up ticket". After setting up a follow-up ticket, you will see the expected date of your first collection payment. In the case of a wrong account, you can use the "Change Payment Data" button to correct or change the account to be debited. You also have the option of making an interruption in the followin of the tickets to a specific date, or indefinitely, or eventually canceling the follow-up ticket creation. The starting price of the follow-up ticket is derived from the following table. The price of each subsequent follow-up monthly ticket will be deducted by the amount shown in row 2 of the following table. The cost of a follow-up monthly ticket cannot be lower than that shown in row 3 of the following table. For every commenced missed calendar month when the customer with his follow-up monthly ticket did not directly link to the previous follow-up monthly ticket (or to a previously paid valid non-transferable ticket), the monthly price of the follow-up monthly ticket will be increased by the rate shown in row 4 of the following table. The maximum prices for the follow-up monthly tickets are listed in row 5 of the following table. More information and details of the follow-up monthly tickets can be found in IDS JMK tariff (pages 23-24). How to pay a fine from public transport online using this e-shop? Eshop Brno iD allows you to pay (public transport) fines online from the comfort of your home. In case you do not have an account on this site, you need to register. Enter a valid email address and choose a password. Then confirm that you are not a robot and click the register button. If you already own a Brno iD account, just log in. After logging in (sign up), select the Public transport section and the "My inspections" tab. Now you just need to enter the number of the fine and the date of the fine. 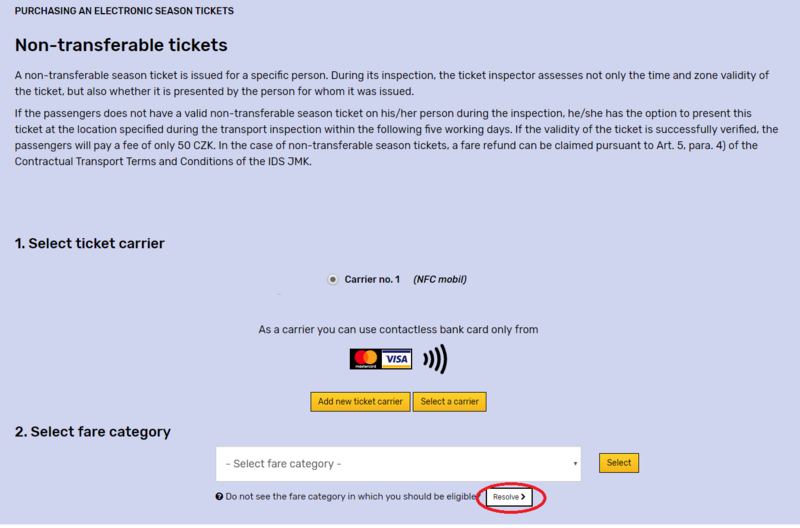 In case of a successful search, the system will show you the amount to be paid and you can switch to the payment with the yellow button (fines are usually entered into the system at the end of the day when it was awarded. If your fine is from today, just wait till the evening or the next day and try it again). The shopping cart displays the amount to be paid (you can always pay only one fine at a time). After that, just choose the form of payment and go to pay. By successfully paying the amount in the eshop, the fine is solved. Full amount of the fine 1500, - CZK (+ possible fare) in other cases. Fee 50, - CZK for the forgotten public transpot ticket (forgotten carrier), if you owned to the time of the fine a valid non-transferable electronic public transport ticket. This amount can be paid (after it is registered at the end of the grant day) within the next five business days. Payment of this "fee" can only be settled on the customer account to which the non-transferable ticket is bound. How does the bonus program for public transport loyal users work? The program is designed for e-shop customers using electronic public transport tickets and is automatically active for all customers. Maximum amount of points is limited to 50 points. The points you receive above the maximum will be automatically transferred to the contest (where you can win public transport ticket for free). You can check the status of your bonus points at any time in the Public transport module in the section "My inspections". You earn bonus points for successful revisions of your electronic public transport tickets. 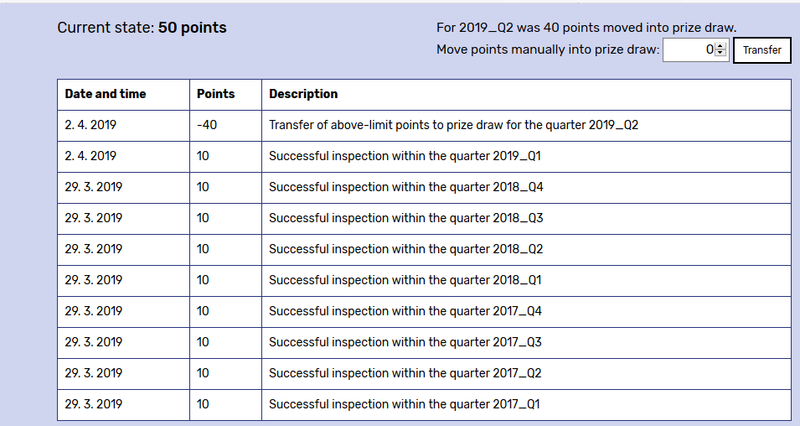 You will receive 10 bonus points (after the end of the quarter) for each quarterly period in which you have been inspected successfully at least once. Points were credited backwards for all inspections from the beginning of 2017. What can I use points for? You can use the points to reduce or fully pay a 50 CZK penalty in cases where you have failed to prove to the inspector that you have a valid electronic public transport ticket (forgotten carrier, non-functional or non-activated carrier, etc.). You can also use them in a contest, in which three winners will be drawn (about once every six months), who will receive a non-transferable yearly public transport ticket for free. Each point invested in the competition behaves as if it were one lottery in a raffle. Can points apply to other DPMB services and products? Not for now. Points cannot also be exchanged for money and cannot be used for other services and products. How do I pay a penalty of 50 CZK using bonus points? In the "My Inspections" section, after a successful search for a fine by its number and date, you will find a box in which you can enter the number of points to apply and reduce the amount paid in case of non-zero bonus points. You enter the number of bonus points you want to use and you will then pay the rest of the fine. If you have a full 50 bonus points, you will automatically see the "Solve fee just with bonus points" button, after which the penalty will be resolved immediately. 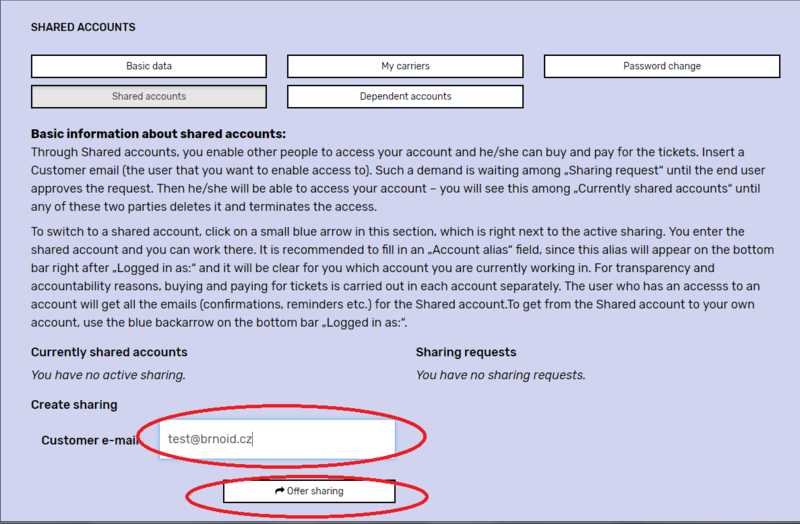 What is and how to use sharing of customer accounts? Account Sharing is used to allow someone to access your account, so he/she can take care of buying and paying tickets or other services offered at Brno iD. 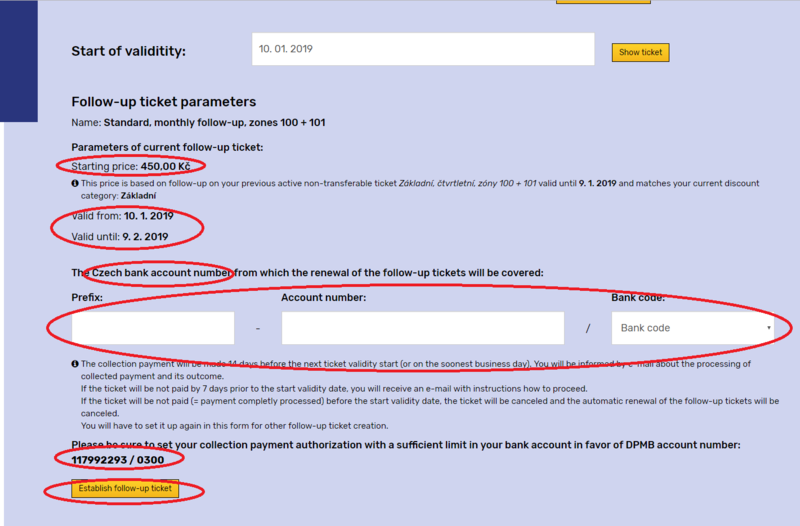 Information and other messages (for example about the upcoming ticket expiration) to the shared account are sent as a copy also at the email of the controlling account. How to do it? After logging into your account, select the "shared accounts" section. In the window that appears, enter the email of the customer to whom you want to grant access to your account and click on the button to offer sharing. If the target account exists in the eshop, a message will appear in the green box. With the blue "trash" icon you can delete and cancel the request at any time. If the target account does not exists, a warning will be shown and you will need to check the target account's address. Now you need to wait for the target user to accept your request. To accept sharing he should use a green "dart" icon or refuse sharing by using the blue "trash" icon. After confirmation, sharing will be set up. Use the blue "arrow" icon to switch to a shared account at any time. Use the blue "trash" icon to stop sharing. You can always go back from a shared account using the blue arrow on the top bar next to the listed name and email of the account you're in. Account sharing is one-sided. This means that the user who offers sharing will only allow other users to access own account but cannot control the other account. 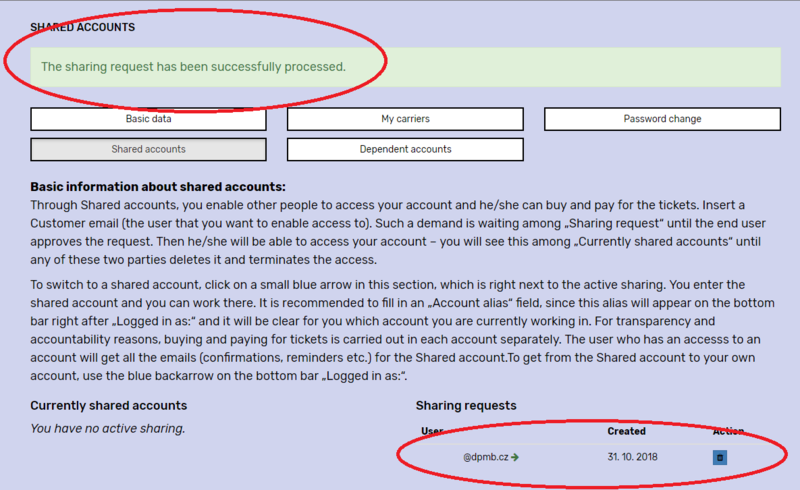 If you want both-way account sharing, you need to create and accept sharing offers on both accounts. What is and ho to use function of dependent (usually children) accounts? The system allows creation and management of dependent accounts. A typical example is that the parent sets up dependent accounts for their children (in the appropriate section of "My Account") and can then fully control these accounts. This means that you will be able to buy tickets and other products in these accounts and get an overview and information about them. As soon as the children grown up, it is possible to terminate the account's dependence via the Customer Service Center by setting own credentials for these accounts. You now have a dependent account created. This account has a generated virtual email address, all information (confirmations, alerts, etc.) emails are automatically forwarded to the email address of the main account. Use the blue arrow icon to move to a dependent account. If you created this account for the purpose of buying non-transferable public transport tickets, then you must fill in the needed personal data of the dependent person (name + surname + date of birth + address) and upload the photo. 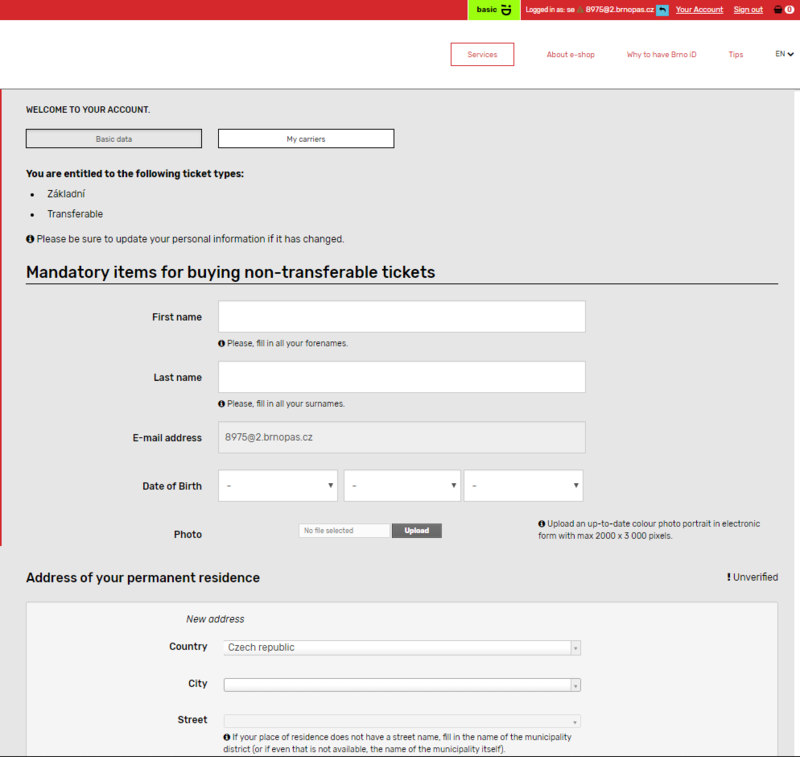 You will then have access to the purchase of non-transferable tickets. Dependent account has its own shopping cart that works in the same way as by standard accounts. You can also let verify personala data of a dependent account (by proving their correctness) to obtain a verified "full" status for dependent account. You can always go back from a dependent account to your own account. At the top bar next to the listed name and email of the dependent account is a small blue arrow icon that you need to use. 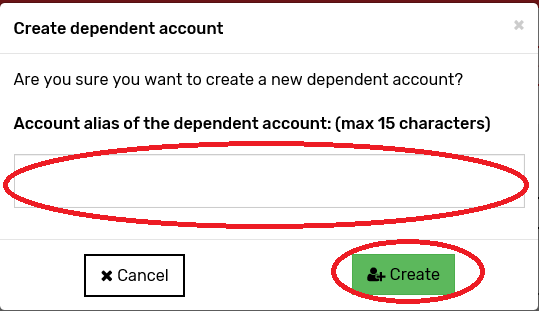 You can use the above steps to create multiple dependent accounts.